Founded by Reggio Emilia in 1986, Anartidee specialises in making furniture and ornaments with character. The Italian company tries to bring a little bit of surrealism to everyday objects like clocks, vases and photo frames – making their range the perfect way to inject some strangeness into your household. 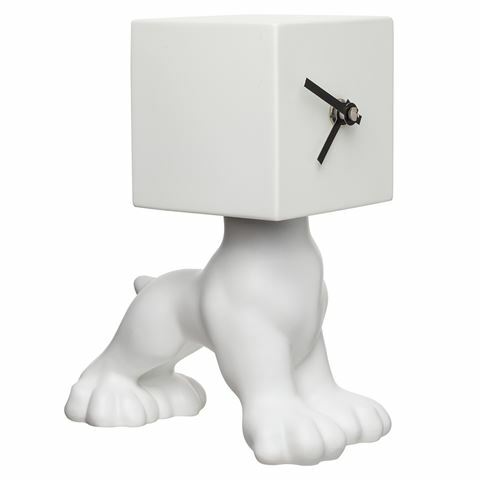 The Artidee White Dog Box Clock features a quirky design that’s hard not to love. This box-headed dog not only looks delightfully weird, but it’ll also help you keep track of the time. Why bother with standard clocks when you can go for one unlike any other? Equipped with a German UTS quartz clock mechanism. Head can be swivelled around. Requires 1 x AAA battery (not included). Presented in an Antartidee box. Dimensions: 8.5cm (l) x 18.5cm (h) x 12cm (w).